When Sharon retired after a career as a pharmacist, she decided to take her life in a whole new direction. It was the nomad life for Sharon. “I really am a gypsy at heart,” she told CheapRVliving. 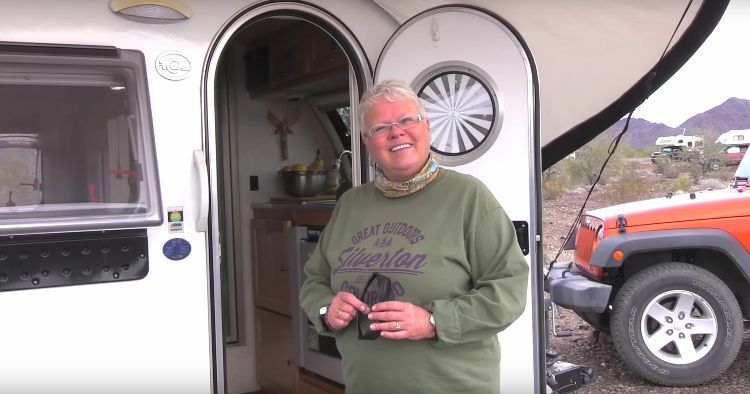 Sharon lives in a 2015 T@B M@x S model teardrop trailer that she hauls with a 4-door Jeep Wrangler. The trailer, which she purchased for $15,000 plus taxes, weighs less than 1700 pounds dry and is easily pulled by her Jeep. The trailer can be powered by plugging into electricity or by three solar panels that conveniently fold up into a case when she’s off-grid. She’s had larger trailers but says she wouldn’t give up her tiny teardrop for anything. Though she can fully stand up in every part of her trailer, she said living in such a small space took some getting used to. 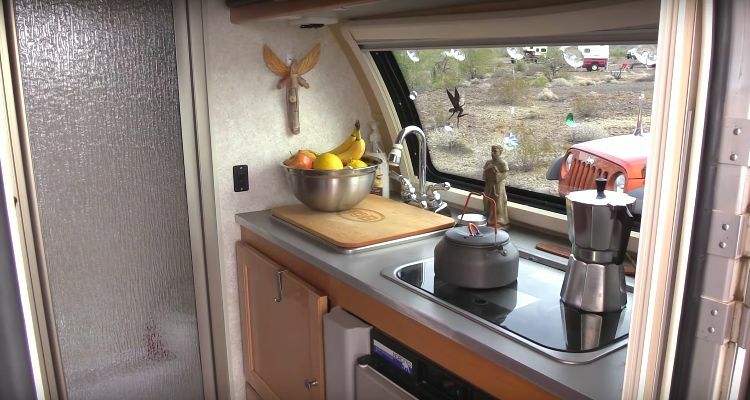 Her trailer includes a kitchen with a small three-in-one refrigerator that runs on propane, plug-in electricity or a battery; a sink with a cutting board cover; and a two-burner stove but she often likes to cook outside. The trailer includes a total of 12-feet of trailer space and is 5 feet and 9 inches at its tallest point. It is heated by a furnace that was included with the trailer, but she also uses a propane heater if she wants to heat things up within two to three minutes. The trailer houses the tiniest bathroom you’ve ever seen, which is essentially a small closet with a toilet that also acts as a shower, so you shower with your toilet. “When that hot water hits you, you don’t care,” Sharon explains. It includes a space for a CD/DVD player and has a flat-screen TV. There is seating around the edge of the trailer and a sofa that folds over into a bed, which she usually keeps down as a bed. She brings in a little wooden table to eat on. The air conditioner can be used with she’s plugged into electricity. When it gets hot, she turns on air conditioner which can be used with she’s plugged into electricity. The trailer also has lots of windows that open all the way with screens that bring in tons of light. There’s also an overhead fan. 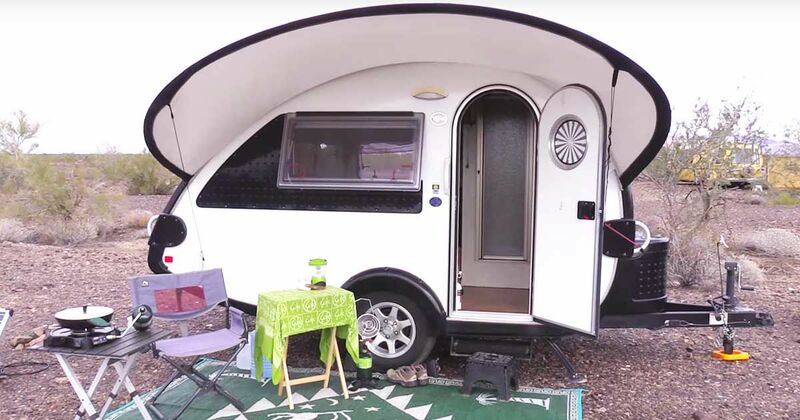 Living modestly and having to the freedom to travel is just one of the benefits of living in a tiny trailer for Sharon. She says the best part is getting to make so many new friends. You can watch the video tour of her home below.